It is easy to install 6E5 in place of oscillator tube because socket's pinout of this amazing valve is nearly the same to pinout of common 6J5 and 6C5 triodes. 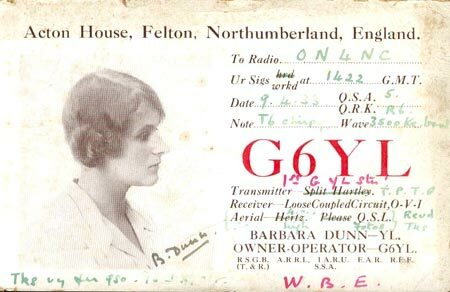 Barbara Dunn, G6YL was the first British transmitting radio-lady - her amazing story and some beautiful old photos can be found here: "Tribute to Barbara Dunn". 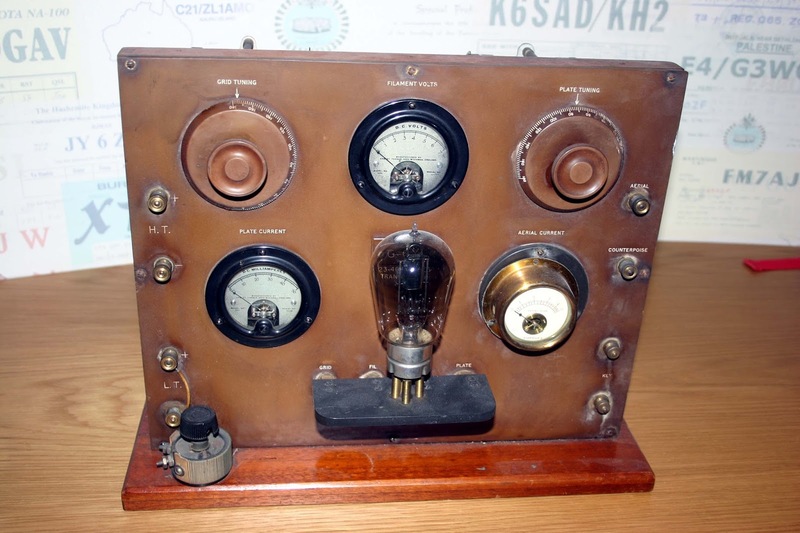 When I came upon that page at the very first time, I've noticed the unusual transmitter with a spectacular Marconi vacuum tube (I prefer to use term "valve" in this case), described in the text as "Her original transmitter employed an L.S.5 in a Hartley circuit". Digging the Net I discovered (here⬈), that that Hartley has been turned into the TPTG transmitter later. Unfortunately I had not found any more information about this radio - neither drawings, nor interior view. As it turned out then, my friend Lou, VE3AWA has looked for this information too, so we joined our efforts. I really appreciate Peter, G4XEX, volunteer operator at the RSGB National Radio Centre, who took these detailed photos and allowed me to publish them on the Internet. In email communications of August 2013, Peter told that he would help "in case anyone else wants pictures of anything we have at the NRC". 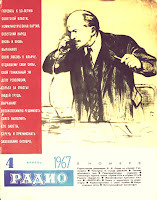 Yet another vintage Soviet magazine with a yellow-red cover and the giant LENIN quote. Not the best possible design ever, let's turn over the cover. 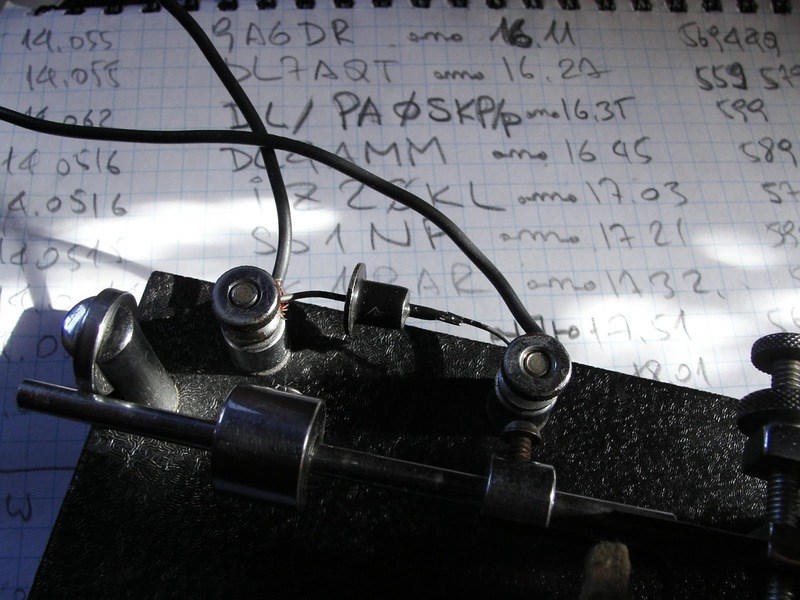 In this article my attention has been drawn to the unusual transmitter with the sounding name "Иккльз-Мени", but the article is very interesting itself as it gives us the ability to imagine the Ham Radio life in several European countries at that time. I tried to translate it as close to the original, but keep in mind that this article has been translated several times before – Russian translation after the German article and, I suspect that that German publication has been translated from the French source. 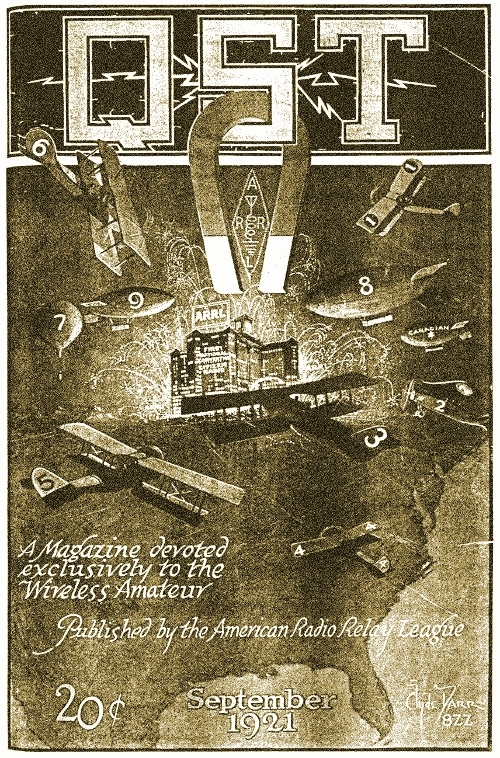 Some time ago digging the web for information on The Radio Club of Hartford, I came across this article in QST magazine (September issue, 1921). In a nutshell, it is about a QRP contest as it should be - "Do More With Less" and then measure how big this "More" is and how much spare "Less" were used. 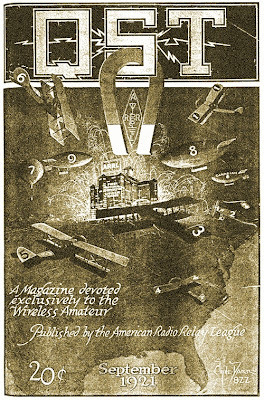 I read this article briefly: something about some kind of reward, some competitions, the names - not very exciting at first sight, but one remarkable thing caught my attention - The Winner, transmitter that won a first prize. This TX has turned my stereotypes upside down (once again): how should it work? where is a rectifier? grounded plate tank? keying the grid-leak?? I have to investigate, or even better - to make my own, based on this article, design and run such a prehistoric radio on the air! So, is that contest over? I do not think so, not yet, not for me.. The Radio Club of Hartford (affiliated) recently conducted a very interesting contest in the building of C.W. sets. Several months ago the rules were drawn up and about a dozen members entered. The idea was to devise a simple inexpensive C.W. set of low power, preferably operating from 110 volt lighting current, to supersede the spark coil in the small stations about town. 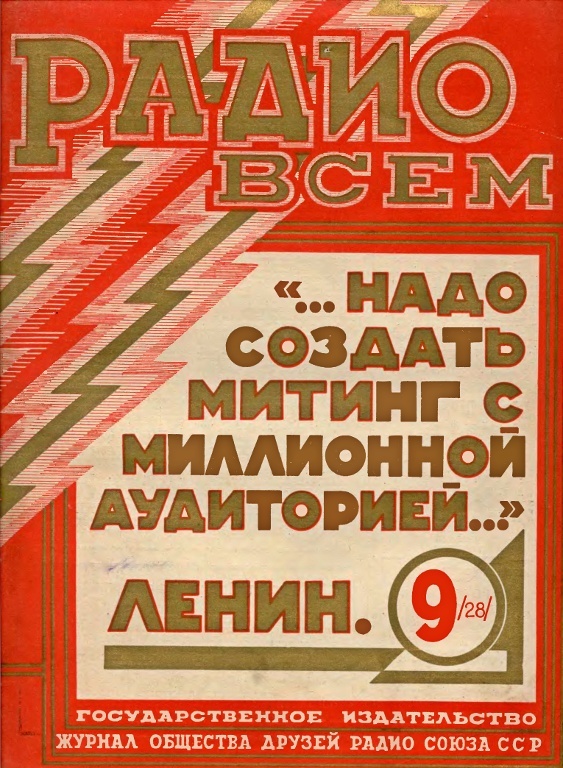 The sharper wave and greater distance with reduced interference made this very desirable, and the Radio Club of Hartford is to be commended for instituting steps that can well be followed by other cities in the reduction of QRM. The awards were made at the final meeting of the club before closing for the summer, and eight contestants were on hand with their sets. These were of every imaginable description, but mostly following the general idea of a small base bearing a vertical panel carrying the controls, with the apparatus behind. Considerable ingenuity was displayed in the source of power. Several of the sets used step-down ("toy") transformers on the 110 volt supply, the low potential current thus obtained being used both to light the filament and to operate a spark coil with regular interrupter, the secondary voltage of which was dropped by a shunt condenser and then fed to the plate of the tube. These sets of course would operate from a storage battery equally well. It was a condition of the contest that the operating wave length should not exceed 200 meters, and thru faulty design only two sets were able to achieve this - those submitted by J. C. Randall, 1ANQ, Dist. Supt., and F. H. Schnell, 1MO, our Traffic Manager, who is incidentally vice president of the club. Both of these sets, however, were able to get down to 180 meters, altho readings were taken at 200. A phantom antenna was used, consisting of a 12-ohm resistance and a mica condenser of .0005 mfd. capacity, in series with a Jewell thermo-couple ammeter. 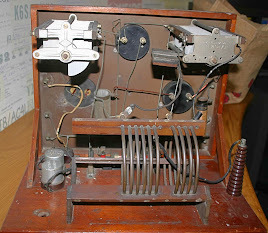 I'm not sentimental, I'm just as romantic as you are, so I agreed with Mac W8ZNX that "a bit of a chirp and some drift" is not a drawback, it is an attribute, trait of a telegraph radio station, especially the Glowbug one. Just a bit, not too much, and how big this bit should be, I prefer to choose myself. Well, I used to use a Straight Key, then learned a BUG, and everything was fine until I used a cathode keying of a rock bound oscillator or a differential keying of my Magic Eye MOPA transmitter. When I tried to manipulate the high impedance grid circuit of the TNT oscillator, I got a pretty nasty instability of note, specifically at the dots generated by semi-automatic key (dot contact spring, you know). As I see it, the dot contact spring produce a micro spark, discharging the bypass capacitor sporadically, so that every time the exciter starts to oscillate, it has unpredictable remaining voltage on the tube grid. This effect is negligible on dashes (non bouncing contact), as well as in case of cathode keying (low impedance circuit). 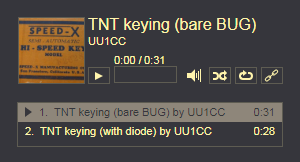 Anyway, additional germanium diode on the BUG contacts solved the problem and I got exactly what I want - "a bit of a chirp and some drift", not too much. WARNING: Can reduce clicks and improve the signal even if you use a cathode keying or rock bound oscillator. For those of my friends tube radio builders, who asked me about "Soviet novice transmitter", "XUSSR QRP TX" (as it pronounced in telegraph),"something authentic, but not too complex" etc, such a RIG should be a good choice - easy to build and clearly adjustable design, small amount of widespread parts, a lot of potential operational fun (two possible output sockets, changeable configuration, very uncommon CW note, i believe). And, after all - a frumpish bald telephonist on the cover as a genuine sign of Soviet authenticity. This simple two-stage telegraph transmitter has been developed for a QRP experiments on the amateur HF bands. 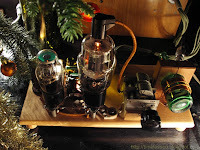 The rock bound exciter on the 6П3С (6L6) vacuum tube utilizes circuit known as the "Three-point" (or Tritet in common notation). The crystal controls the frequency of oscillation - 3510kc in this case. Signal output is taken from a separate tuned tank circuit L1C4 in the plate circuit of exciter; this tank should be tuned to 3510kc or 7020kc. The second stage on the 6П7С (6BG6) tube acts as an amplifier or frequency multiplier (doubler or tripler) depends on an inductance of the L2 coil and bias voltage on the signal grid of this tube. If you would like to use this transmitter on 80m band as well as on 40m with a noticeable lowered power, you have to connect an antenna to the "A1" connector and pull the amplifier tube (6BG6) out from the socket. For the general power output on 7020kc and QRP operations on 14040kc and 21060kc that tube has to be back and antenna switched to the "A2" output connector. Several interesting QSO's has been obtained using this transmitter in October 1966. For example, UA0MX and K2AGU on 14Mc, and F9MC on 21Mc with a power level as low as 1.7 Watt. A Fine - Line Project.